Details about the 2015 Mustang and its redesign have been leaking out of Dearborn steadily over the past few weeks, leaving small clues and much to be desired about what is to come. 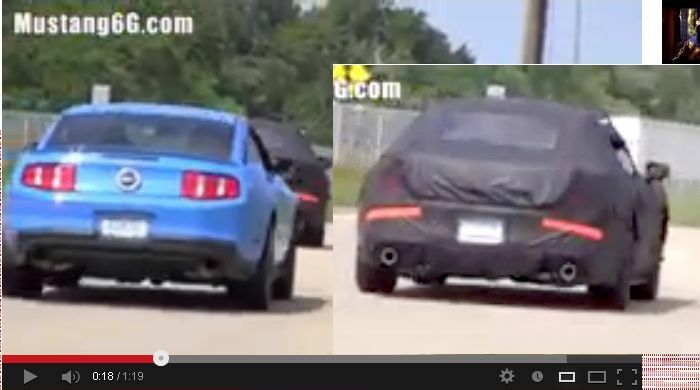 This video now gives us the first real look at a fully functioning and driving 2015 Mustang. Is it a V6 or a V8? Hard to tell, but those big, beefy brakes in the front are definitely something to gander at. The side-by-side ride-along view (starts at :34 in the video) also shows quite a bit of space to be filled under the car’s rear camo. I suspect the S550 to be a much lighter and slimmer platform than the current S197s, as previously rumored. What this might mean in terms of weight reduction is still to be answered, but from the standpoint of a racer or performance-minded owner, lighter usually means faster and that should be a good thing. As for the 2015 motor options and what we can expect under the hood a year or so from now, don’t be surprised when the 4 cylinder EcoBoost Mustangs start rolling off the assembly line. An EcoBoost V6 might even be in store, but that’s still anyone’s guess. A popular rendering by Car and Driver shows a car that might not be too far off from what is under the camouflage. Might we be getting the full-faced, larger grille and smoother lines depicted by C&D? Previous Entry Video: Mustang Mayhem Dyno Event Recap – Over 3,500 RWHP! You folks sell brakes, so you should probably know how to spell the word. Just saying.